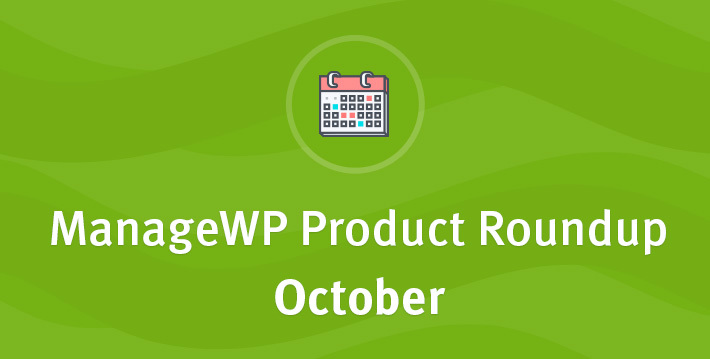 We wanted to put together a product roundup for you for the month of October so that you can be sure you are up to date with all of the latest improvements and feature releases. Overall, October has been a relatively busy month for us with two major feature releases, and four feature improvements. Here is what we did in October. At the beginning of the month, we released Bulk Add Websites, making it easy for you to add multiple websites to ManageWP at once. You can now choose between being able to upload all websites using website URL or to import them from a CSV file. You can do all of this by going to the “Add Website” screen. To find out full details about this feature have a look at our article, it will help you get set up. We also redesigned our Ticketing Tool, changing the flow of how you manage your conversation with our Customer Happiness Team. We added the ability to track entire conversations with a thread view, saved drafts of your tickets before sending, and tags that let you know exactly at what stage we are handling your tickets. Find out more about the new system here. Screenshot comparison when running Safe Updates– you are now able to add a custom URL to your screenshot comparison when running Safe Updates. To do this, go to website settings (either on single site dashboard or by clicking on the wrench icon in the “Websites view”) and under “Safe Update” there is a new URL field. If you haven’t had a chance to try Safe Updates, here is a more detailed look at this feature. Better backup exclude options – We noticed that a few of you were struggling with the “exclude field” in your ManageWP backups. For this reason, we have slightly re-designed how “excluding files/folders” works to avoid unintentional excludes. Instead of just clicking on the file to be excluded, you will be shown all the files you have selected to be excluded (with an option to remove some or all of them from the list) in the confirmation dialog. More about our incremental Cloud Backups is here. Removing SEO keywords with one-click – We have added additional remove options to the SEO tool. You are now able to select multiple keywords or select all keywords and remove them in one go. If you haven’t tried this feature, you can find more information here. Additional languages added to Client Reports – Client Report is now available in 28 languages. When creating a Client Report or a Client Report template just select your preferred language from the dropdown list. Here are the latest languages we added, don’t forget to make suggestions for our next batch of languages. Don’t forget you can track all of our feature releases and improvements in our Changelog. The Changelog can be found by clicking on your profile name, and in the dropdown list, you will find it. Let us know what you like, and what you would like us to focus our efforts on more. Nevena wears many hats in ManageWP. One of them is being responsible for translating our team's geek talk and product features into value that normal people understand. She believes that "learning is a treasure that will follow its owner everywhere", so she tries to learn something new every day. 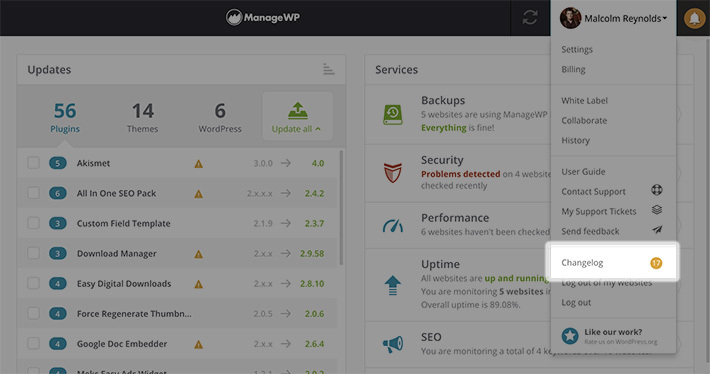 Its a great news for manage WP user and really useful update. Its’ no doubt that Manage Wp is one of the popular tool for WordPress users. Thanks a lot for this information and have a great weekend.